Accumulating office waste is inevitable. After all, a lot of paperwork, packaging, and other materials go into making an office busy and profitable. Knowing more about the waste you generate, and how you can manage them can help you free up more space, time, and even resources. Managing waste properly also has undeniable benefits for the environment, and for the community. With the right sorting system in place and a reliable Lake Macquarie skip bin hire, you can keep your office cleaner and more productive. 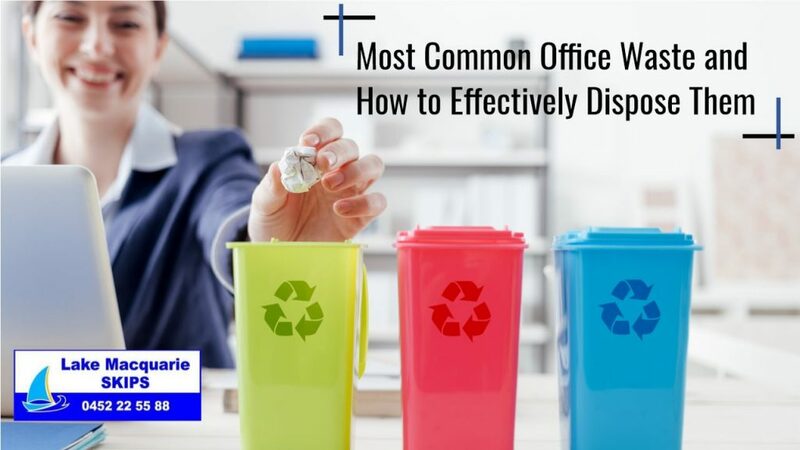 These are the most common waste types that you might find in the office. It’s helpful to know the types of waste to expect so that you can prepare the proper rubbish bins. You can segregate the waste into general waste, recycling waste, food waste, and other subcategories depending on the rubbish type. No matter how big or small a company, you can expect a lot of paper and printing product waste at the end of the day. These materials are essential to handling paperwork, from simple meeting memos to business inventories. While disposing of reams of paper every week is nothing out of the ordinary, your office can still save up a lot in resources by reducing the paper and printing product waste generated. With less waste, you will also need less space when it comes to skip bin hire, reducing costs even further. Reuse paper by shredding waste documents and reuse boxes from shipments and packages. Distribute memos and draft documents via email. Store manuals, e.g. employee handbooks, online. Reduce paper towel use by providing air dryers or reusable towels. As time goes by, everything from desks to computers needs an upgrade. This makes office equipment a type of common office waste. However, office equipment is costly to both acquire and throw away (the bigger the waste, the larger the skip bin needed, for example). Reducing any costs associated with office equipment turnovers and managing waste well can go a long way. Consider looking for cheap or used furniture as well as remanufactured cubicles when outfitting the office space. This reduces the overall waste in the community. Buy used or older models of copiers, faxes, and printers. As long as the equipment is still efficient, you can go for the less expensive option. This is especially true for offices handling mostly memos and documents that will only circulate internally. Local recycling centres often have programs to manage everything from used mobile phones to desktop computers. Inquire with your waste management service for options. Strike a balance between saving costs now versus saving costs in the future. More durable equipment often means less waste as there will be a slower turnover rate in the equipment. Most offices have common areas such as a pantry or water station. These places also receive a lot of traffic during break times and can generate a lot of waste as a result. Reducing waste in these areas can be done by providing reusable utensils and dishware, and by providing drinking water stations to lessen usage of water bottles. Other wastes include maintenance wastes such as cleaning supplies. With proper planning, the different types of waste generated in the office can be expertly managed. Lake Macquarie Skips offers skip bin hire services that can help you manage your waste easier and more effectively. Depending on the type and amount of waste generated by your office, you can regularly hire our skip bins ranging from 2m3 to 30m3. We offer prompt and reliable waste collection services. Contact us today at 0452 22 55 88 for more details!